Tires, as we’ve pointed out time and time again, are some of the most important things you can have on your car, as they are what connect the car to the road. All tires have useful information written on them. Here’s how to decipher what it all means. Engineering Explained is back, this time with some handy consumer information. Have you ever look at the sidewall of your tire and seen a bunch of letters and numbers and wondered what it all meant? This is the breakdown. If you read that long string of letters and numbers spelling out a tire’s measurements starting from left to right, you’ll probably see a “P” or “LT” first. That just distinguishes the tire as being for a passenger car or light truck. Passenger car tires are meant to carry people, while a light truck tire will generally have a stronger sidewall so they can bear more load. The tire’s measurements come after that and are written as a bunch of letters and numbers separated by a slash. The example used in the video was a tire with 235/35 ZR20. It’s a little confusing because the first number is expressed in millimeters, the second is a percentage and the last is in inches. Anyway! That 235 represents how wide the tire is from sidewall to sidewall in millimeters. The 35 is an aspect ratio; it tells you that the tire’s sidewall is 35 percent of the tread’s overall width. So, if you multiply 235 mm by 0.35, then you’ll find that the sidewall is 82.25 mm thick. Now for that ZR20 bit. That “Z” has to do with the speed rating (which we’ll discuss more in detail below). The “Z” used to designate that a tire could go over 140 mph, but ever since cars started getting faster and faster, the “Z” became irrelevant and now it’s being kept around mainly for aesthetic purposes. The “R” stands for the tire’s construction, meaning that this one has radial construction. A radial tire has plies that “run perpendicular to the direction of travel,” according to CarsDirect. Advantages include a softer ride quality, a more flexible tire wall and less heat buildup. If you see a “D,” then that means the tire has a diagonal bias with the plies are angled rather than perpendicular. The “20” means that the tire is designed to fit a 20-inch wheel. Since most P-metric passenger tires are manufactured in the standard load range, they will have nothing branded on their sidewalls or may be branded standard load and identified by an SL in their descriptions, as in P235/75R-15 SL. The “Y” that follows the load rating indicates the maximum speed that the tire was designed to reach and maintain safely. It’s also worth pointing out that your tire should be in good condition when you’re checking your speed rating, as wear and tear can affect this. Then there’s the “Max Press” indicator, which tells you the maximum cold tire pressure that the tire’s been designed to take—a tire on a car that’s been at rest and not heated up from driving around. It is not the recommended tire pressure, though. That information can be found in the car’s doorjamb. Tires will also be printed with information regarding what kind of materials they are made from. Unless you are some kind of tire and rubber scientist, this information is probably not necessary to most consumers. Then, if you have it, there might be some kind of acoustic marker, too. Basically, because a rolling tire makes a lot of vibration and noise, manufacturers try to make them as quiet as possible, so as not to disturb the occupants inside the car. Next up is the tread wear grade, which tells you the wear rating of the tire. The higher that number is, the longer your tread will last. Lower numbers mean that the tread will wear out faster. As an example, a tire with a grade of 300 will last three times as long as a tire with 100. These numbers, however, are assigned by tire manufacturers and not an independent third party, as Consumer Reports points out. So you should be careful about comparing grades across different manufacturers. There are four categories of traction rating, according to Discount Tire Direct. They are, from highest to lowest, AA, A, B and C. These measure stopping in a straight line in the wet. 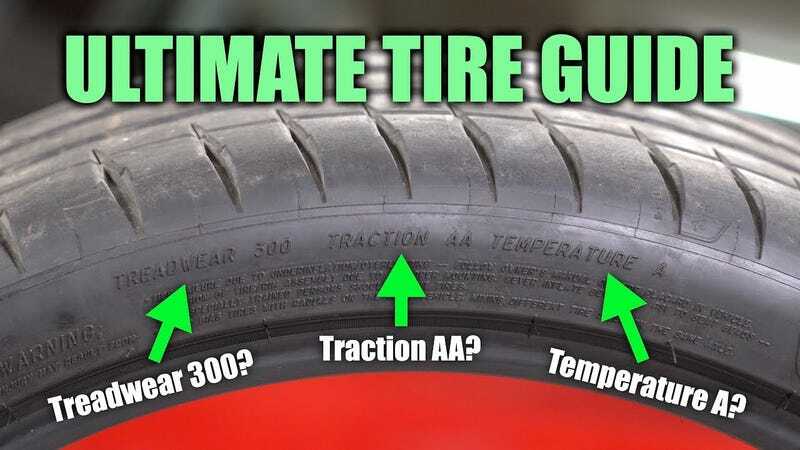 The video explains that only about 15 percent of tires have a “AA” traction grade. Most of them have an “A” grade. Temperature grade measures a tire’s ability to resist heat. There are three grades for this: A, B and C, which C being the minimum requirement that all passenger tires have to meet . The last few labels include DOT (the tire meets the Department of Transportation’s safety requirements for use on public roads) a plant code (indicated where the tire was made), another manufacturer code (telling you which batch of tires yours are from) and a timestamp of when the tire was made. The example number of “3118” means that the tire was made in the 31st week of 2018. It can be a lot to remember, but it’s useful and helpful when it comes time to buying new tires or inspecting the tires on a car that you’re thinking about buying. A good set of tires can save your life, so be mindful when considering them. How Do Mazda&apos;s Engineers Reduce Turbo Lag In SkyActiv Engines?